Antony Holborne’s Pavans, Galliards, Almains and Other Short Aeirs both Grave, and Light was published in 1599. Described as being ‘for Viols, Violins, or other Musicall Winde Instruments’, one imagines the publication being aimed not only at gentlemen amateurs of the viol but also at those wealthy patrons (such as the collection’s dedicatee, Sir Richard Champernowne) who employed a group of professional musicians who might have been proficient at all the instruments listed. L’Achéron perform their selection as a viol consort, with the addition of plucked continuo – lute, bandora and cittern, plus virginals. The programme is planned imaginatively: groups of five or six contrasting pieces in compatible tonalities. The treatment of the individual dances is imaginative, too, varying the continuo sound and adding extra repeats to the shorter pieces. This is all highly effective but in the case of the galliard Ecce quam bonum the form is oddly changed: three repeated sections are reordered so as to make a rondo. The solemn pavans are especially well played, each one given its own character (the final track, The Image of Melancholly, performed by the viols alone, is truly touching). For the more lively dances, particularly the almains, L’Achéron choose quick tempi and play boisterously; to my ears, this tends to detract from their memorable melodic quality. 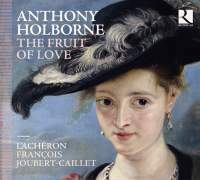 And a resonant Holborne, however, wins through; it’s a real pleasure to listen to this delightful music, done with such verve and understanding.